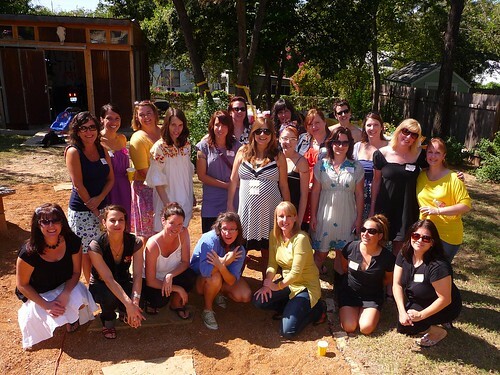 We converged on Austin, Texas from all corners of the continent for a Celebration of Life. J & M are creating more than a happy life for themselves, they are creating life itself and taking on the ultimate long term art project of creating a person. So like any three day shinding, the womenfolk gathered champagne and rock onesies and kicked out the men for the afternoon. 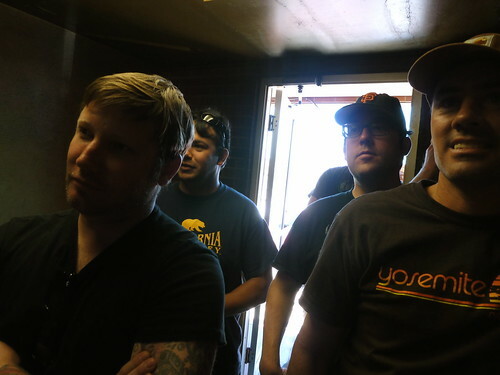 We piled in the trucks and headed out of town. 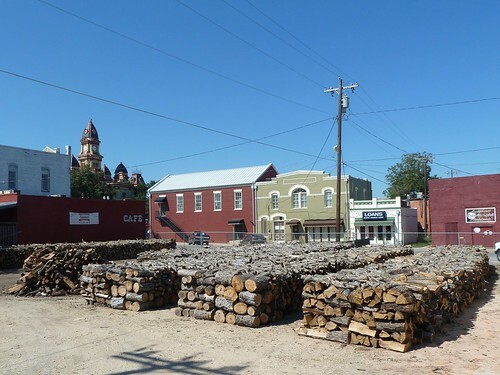 Lockhart, Texas is a small town 35 non-scenic miles from Austin. A straight highway strewn with flea markets and highway patrol. 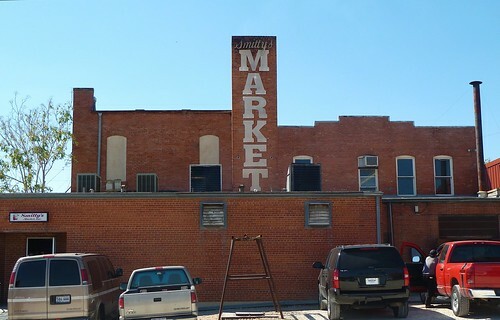 In downtown Lockhart we pulled into a back lot and found this. That's a lot of wood. Literally. A good sign to be sure. The line was out the door. But soon we were in. The Anticipation! The Heat! The Smoke! The Staff! The Texans! This isn't atmosphere, it's a way of life! 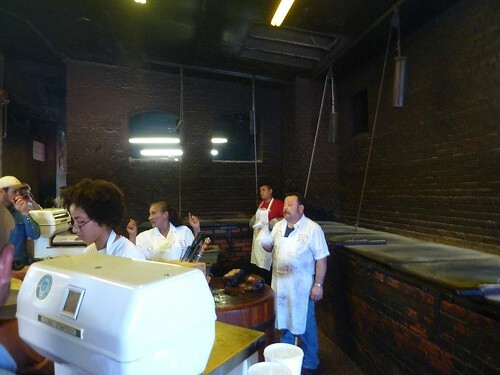 The whole lid on those boxes opens up to reveal square yards of meat and fat and fire and smoke! That man is loved where ever he goes because he smells like Smitty's! Tell the young lady how much of what, she turns around and tells the man with the knives, and turns back and slaps meat on paper on the scale. 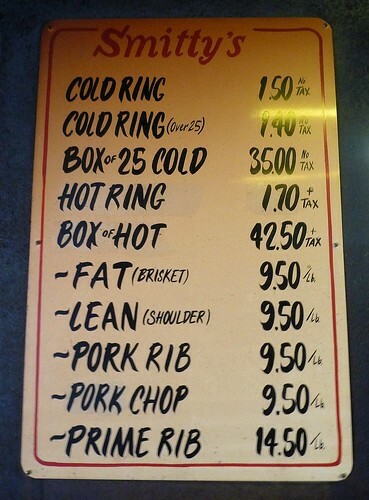 Gimme three, no four ribs, a half a pound of lean and a half a pound of fat. Bread, no crackers. 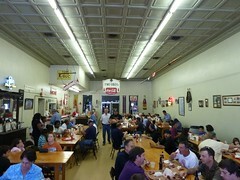 Order a beer and sides at another counter in the dining room and wedge in. Don't be shy cause I'm not. This is finger food. 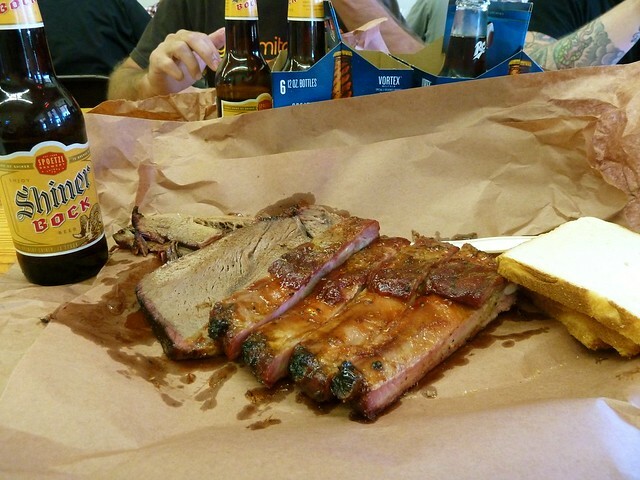 Sorry you can't hardly see the brisket under the leaner shoulder because it is the best BBQ I think I've ever had. A beautiful line of fat running down it, tender, juicy, GONE! The ribs were killer and the lean was quite good for it's cut, but that briskrt, DAMN. What do you guys think? 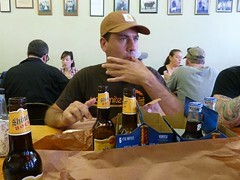 Yeah, it was a quiet lunch. Here's the small box. 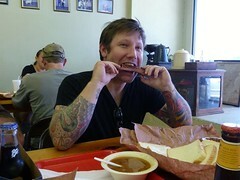 Everyone says Salt Lick first when I bring up Texas BBQ. 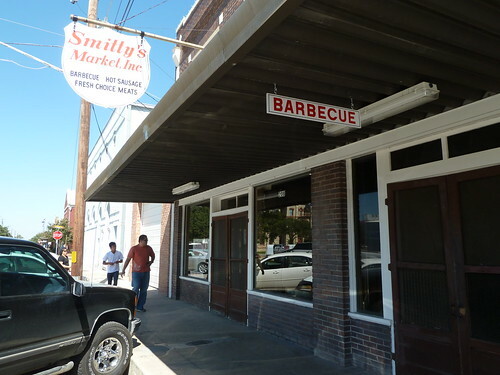 Smitty's is on Everyone's Top Five List tho'. Today it's Number One on my list. 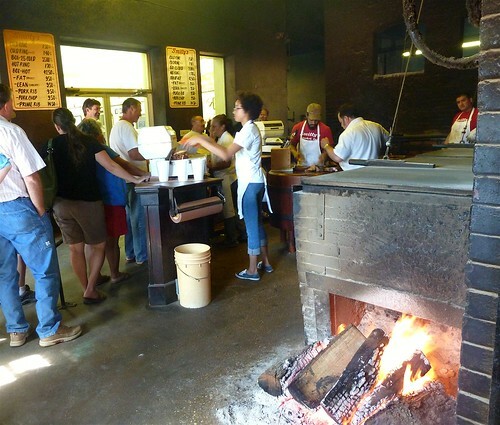 Next time I'll try Salt Lick, hear good things about Kreuz Market too. It's silly, but it means so much to me that you made it. You ate my childhood. We went there SO often. 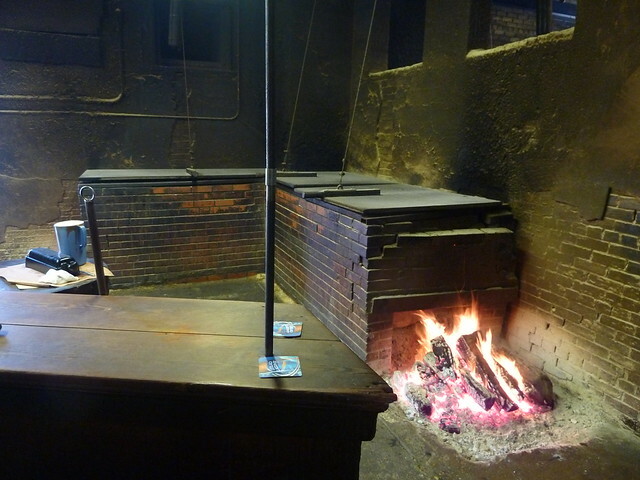 I don't know the whole story, but that is the original Kreuz's- there was some family dispute and split, hence the name change...but you hit the OG BBQ. Damn. Now I don't eat the critters, but you do and I'm glad you did. this was so my childhood too!!! 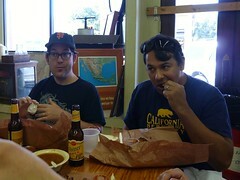 family would come down to us from fort worth and we would all pile up into someone's suburban and drive to lockhart just to eat some MEAT on butcher paper. damn, that isssh is GOOOD. mouth is watering right now thinking about it.